I’ve had the conversation multiple times. A client tells me, “I tried Facebook ads, but it didn’t work.” After asking a few follow-up questions, it quickly becomes clear what happened. The Facebook ads didn’t fail, the strategy did. In most cases, there was none. 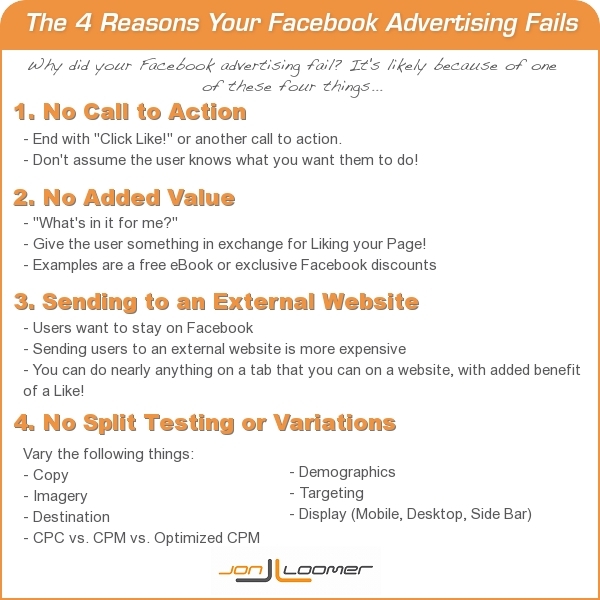 Following are the four main reasons that Facebook advertising efforts fail. Are you committing one of these mistakes? You only have 90 characters to work with (see this Facebook advertising dimensions and character limits guide), so marketers are trying to squeeze everything they can within a small space. Something needs to be cut out. More often than not, it’s the call to action that goes. Your copy needs to do more than explain who you are or what your product does. You need to tell the user to do something. The low hanging fruit is to simply finish your ad copy with, “Click Like!” Yet so many refuse to do it. You told me who you are. You instructed me to Like your Page. But I’m still not motivated. Why? Why should I Like your Page? What should I expect? Will you provide exclusive Facebook discounts? Will I immediately get access to your free eBook? What value will you be providing me? The best way to create an effective Facebook ad that increases Likes is to offer something of value in exchange. Before running your campaign, think of the assets at your disposal that you could offer. I’m not going to say that you should never send users to an external website with a Facebook ad. But I will say that most business owners who do are making a mistake. There are four main reasons for this. First, Facebook users want to stay on Facebook. They didn’t click on your ad because they were looking for your product. They were in the process of communicating with friends before your ad caught their eye. They want to stay there. Second, Facebook wants to keep you on Facebook. As a result, ads that send users to external websites will cost more. Third, ads that send users to an external website have only one positive outcome. If they don’t perform that task — whatever it is — the ad failed. But with an ad that drives users to a Facebook tab, you could have two actions that lead to success: Clicking Like and an action (like providing an email address) on the destination Facebook tab. Finally, there is often no reason to do it. If you are sending someone to a landing page on your website, you can easily recreate that with a Facebook landing tab (read this post about How to Use Tabs as a Facebook Advertising Destination). When someone creates a Facebook ad that sends people to an external website, it’s usually because they don’t know better. They usually complain about the cost. They usually don’t know how to create Facebook tabs. They usually send users to a generic page that isn’t trackable. They have no strategy. Yet, they wonder why the campaign failed. This is a big one. Let me be clear: Most Facebook ads fail. Wait, what? You’re saying that if I create an ad with a call to action, offer value and send them to a Facebook Page, it will still fail? Yes, If you only create one ad, the odds are stacked against you. That’s why you need to fail — and fail a lot — to succeed. Copy: Switch up what you say and how you say it. Imagery: Use different faces, color schemes, images with and without copy. Destination: Test different landing pages for the same ad. CPC vs. CPM vs. Optimized CPM: Sometimes, one will be more efficient than the other. Demographics: Target different copy and imagery to different groups of people. Targeting: Try with both detailed targeting and minimal targeting. Display: Create separate ads that are displayed on the right bar, News Feeds, desktops and mobile devices. When you’re done, you will have dozens of ads. Monitor them closely. Keep the budget low in the beginning. After a day or two, stop the ads that aren’t performing. What you’ll have left is one or two high performing ads. Up the budget on those ads and ride them into the ground until they are no longer effective. Facebook advertising is enormously effective, when done right. But while there are best practices that you need to follow, there is no magic bullet to run a successful advertising campaign. As a result, you need to split test and run many variations to figure out what works. To succeed, you must fail — a lot. Failing a little means that you didn’t try hard enough. 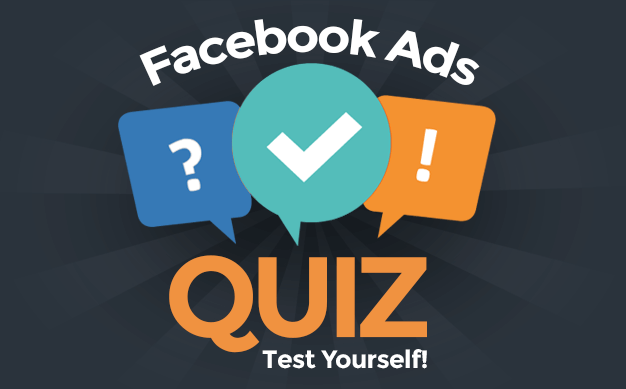 What variations do you use in your Facebook ads to find success? Tell your story in the comments below!